We believe every single idea has value and we secure every version of every file ever created. We give you what other security software can’t – total data visibility & recovery wherever that data lives and moves, so IT & Security teams can tackle the most time consuming stuff a lot faster. For more information, visit code42.com. The EU General Data Protection Regulation (GDPR) deadline of May 2018 is fast approaching! In the midst of preparing for the new regulation, it is equally important to understand how to provide visibility into endpoint data generated by your knowledge workers, and how to protect it. 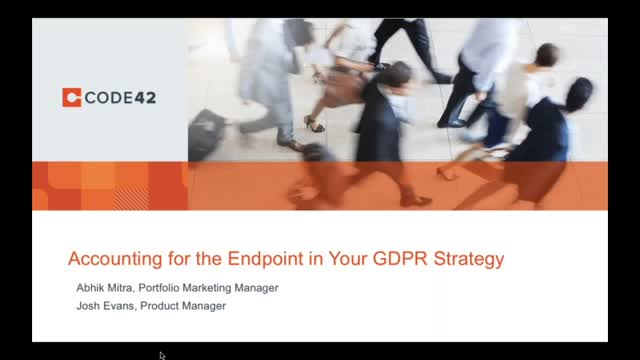 In this live webinar, Code42’s Josh Evans, product manager, and Abhik Mitra, product marketing manager, will discuss how Code42 addresses the endpoint gap and enables your GDPR strategy. Today, companies struggle to detect data exfiltration or theft because they aren’t equipped with the necessary tools to collect, analyze and detect risky file movements. It’s an issue that currently costs the average company $4.3 million a year and unfortunately, this is a growing trend that promises to only get worse. Your mobile employees have valuable ideas and client data on their machines. In fact, as much as 70% of employee-created company data lives on laptops. But in the event of the inevitable cyberattack, traditional ring-fenced security models are unable to protect this data effectively or recover it quickly without slowing down or otherwise burdening your employees. Insider threat refers to an employee or contractor who misuses his/her authorized network access to carry out nefarious activity. Today, sophisticated hackers are compromising user credentials and moving silently within an organization’s digital infrastructure under the guise of an employee profile—an inside threat. Security teams must prepare to recover from both. Today, end users and IT alike understand the role technology plays in powering productivity. Employee success hinges on having the right tools and technology to work smarter and faster. As a result, businesses have found themselves with a mixture of device types and operating systems in their organization. So how can you adapt to efficiently support and enable employees through device choice? In this webinar, we’ll explore how Tableau Software succeeds in a cloud-first, mixed device environment that allows employees to choose their preferred operating system. Aimee is a product marketing manager at Code42 where she helps internal audiences understand what’s happening in the category and influences product decisions through customer and market research. She has always worked in the technology industry, launching her career at data storage company Compellent Technologies at the age of 19. In her free time, she enjoys traveling with her Aussie husband in an attempt to balance her TV addiction. While infosecurity teams are playing defense against external threats, they cannot lose sight of the threat that insiders at their organization pose. Employees, contractors and business associates can all have accounts which provide them legitimate access to systems within the enterprise, but that access can carry significant risk. Detecting, monitoring and preventing such unauthorized access and exflitration is critical. Building an Insider threat program to manage such functions can help an organization get visibility into the problem and streamline these efforts. But where does an organization start when building such a program? What underpinnings need to be in place in order to have success with a program? Get an inside scoop on what it is really like to build and run these types of programs; what are insiders really doing and what are they stealing. Join Code42 and (ISC)2 on March 16, 2017 at 1:00PM Eastern for a discussion on how to construct an effective insider threat program. Sponsored by Code42 - More than 45% of businesses were hit with ransomware attacks in the past year. Cybercriminals are rapidly evolving attack methodologies and issuing increasingly higher demands. With no end in sight, organizations are at significant risk for data loss. At the same time, IT security policies, anti-malware protection and end users that lack the ability to recognize sophisticated scams make ransomware inevitable. Join this live webcast and learn about the prevalence of ransomware in the enterprise and best practices for safeguarding your data against attackers. The CyberEdge 2016 Cyberthreat Defense Report (CDR) provides a penetrating look at how IT security professionals perceive cyberthreats and plan to defend against them. Based on a November 2015 survey of 1,000 IT security decision makers and practitioners, the CDR delivers insight IT security teams can use to compare their perceptions, priorities and security postures to that of their peers. •Understand why 62 percent of organizations expect to be breached this year. •Learn which cyber threats are of the utmost concern to the enterprise in 2016. •Explore how Code42 CrashPlan endpoint backup helps safeguard your most important asset–data!